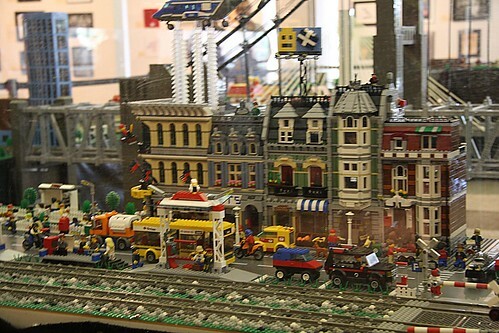 LEGO Victorian houses and helicoper near the train tracks. The Richard Nixon Presidential Library yearly Christmas season miniature electric train exhibit of Antique and LEGO miniature trains, villages. Displays include videos, memorabilia – Two rooms of running trains in villages, mountains and cities. 1) The Atrium Southern California LEGO Train Club (SCLTC) exhibit. 2) The special exhibit room of Lionel and other collector electric trains, in action and on display. Some Wind-up Robots and toys are also included. This entry was posted on Wednesday, June 6th, 2012 at 1:03 pm	and is filed under Lionel Trains. You can follow any responses to this entry through the RSS 2.0 feed. Both comments and pings are currently closed.